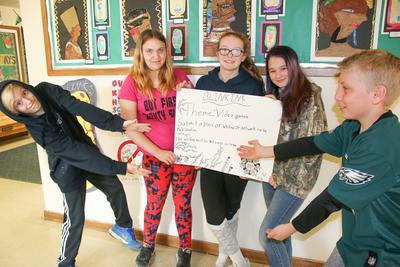 The editing team, made up of Colby Gross, left, Summer Hardie, Jasmine Emerson, Olivia Bates and Reed Pambianco, show off a new poster advertising the project they are working on for Blink Ink Magazine. Students in grades six through eight at Penobscot Community School and the surrounding Union 93 schools are a few months away from becoming published writers. Newly elected school board member Ed DeVito, who is a published author himself, has been working with the students during writing and story telling sessions over the last few weeks. Through his connections, DeVito was able to work with longtime friend Sally Reno, editor of Blink-Ink, a literary magazine filled with flash fiction stories distributed quarterly around the world. When DeVito told Reno he was working with the students, she asked him if he thought they would be interested in developing stories that were 50 words or less for possible publication in the magazine. DeVito did not hesitate, and he and the students have been putting together the stories for the last few months. The students chose the theme of video games as the starting point for their stories, and have been writing everything from a villain climbing out of the television to a player getting a bit too agitated and breaking his gaming console. The students said that while the word limit can be challenging, they have been having fun writing their stories. DeVito said the advice he gave the students was to make each of their words count, because 50 words is “not a lot of time” to tell a story. “The closer you are to the end at the beginning, the better off you are,” he added. The students have a deadline of August, as the plan is to have the stories run in the September edition of the magazine. The editing committee will select the stories for submission, and they will then be sent to the editing team at Blink Ink for final approval. One question was clear among all the students. “Do we get free copies if our stories get in?” asked a couple of the students in unison. DeVito assured them they would.